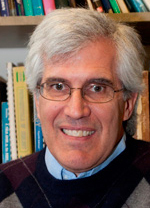 Home > Departments > Faculty > Todd Livdahl Ph.D.
Graduate students in ecology and population biology pursue questions concerning interactions among species and determinants of population size, the relative abundance of species within communities, evolutionary responses to predation and competition, and the evolution of population schedules for birth and death. Mosquitoes that develop within treeholes receive close attention in this lab because they occupy a community of manageable size and are relatively easy to manipulate in the field and laboratory. Students in my lab are currently studying invasions of container-breeding mosquitoes in North America and Bermuda. We have the genereal aim of testing for effects of species interactions on native species in North America and for interspecies competition between two invading species in Bermuda. Students are also studying adaptation by Aedes albopictus to its new environmental surroundings in North America. With the help of dozens of school groups, involving thousands of students throughout the Midwest and mid-Atlantic states, we have organized the Labor Day Mosquito Count. 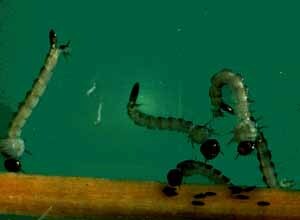 This project aims to quantify the impact of the invading Asian mosquito, Aedes albopictus, on the native treehole-breeding mosquito, Ochlerotatus triseriatus. 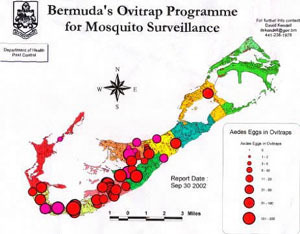 In collaboration with the Bermuda Department of Health, we are working to develop an extensive and detailed data base to trace the course of the reinvasion of the islands by Aedes aegypti (1998) and colonization by Aedes albopictus since 2002. Livdahl, T., and J. Edgerly. 1987. Hatching inhibition: Field evidence for population regulation in a treehole mosquito. Ecological Entomology 12: 395-399.